1) SJBA will be holding its Annual General Meeting (AGM) next Sunday, 5 June 2016 at 9.30am. The Agenda include receiving and adopting the Executive Committee’s Annual Report, Audited Statement of Accounts, and deliberation of other matters as deemed fit by the Assembly and election of the Exco for the term 2016/18. You are cordially invited to join us. 2) Members are cordially invited to attend a 6-lesson “Introduction to Satipatthana Meditation Course”, to be held at Subang Jaya Buddhist Association, end of May till Early June. This is a practical course which introduces the principles and basic teachings of Insight Meditation as taught by the Buddha. At the end of the course, there will be a 4 days 3 nights weekend meditation retreat at Subang Jaya Buddhist Meditation. * In the Orientation talk, we shall brief you the objectives and benefits of attending the course. Please email or call us now to confirm your participation! 3) As part of its Community Services, SJBA is hosting a Cardiopulmonary Resuscitation (CPR) training on 26 June 2016 (Sunday) at 11.30am by a Staff Nurse from New Hope Learning Centre. The training will train participants what to do in case the heart of someone stop pumping, etc. For further information, please call Bro James Khoo at 03-56348181, 56315299. 4) On 17 July 2016, SJBA is hosting a 1-day Sutta Study with Meditation Workshop on “HOW TO DIMINISH THE EFFECTS OF BAD PAST KAMMA”, facilitated by Ven. Aggacitta. Many Buddhists believe in performing various rituals to cleanse themselves of their bad past kamma (or at least diminish its effects) which is influenced by the folk beliefs and rituals. On the other hand, more knowledgeable Buddhists may think that performing more good kamma is more efficacious. The purpose of this workshop to go back to the roots by investigating what the Pāḷi suttas actually say about this matter. However, even more important than mere textual analysis is the practicality of our efforts, discoveries and conclusions: how will they help us interpret the suttas meaningfully so that we can practise effectively to reduce and eventually end suffering. To emphasise this pragmatic approach towards the study of the suttas, periods of mindfulness practice will be incorporated in the workshop. Venerable Aggacitta Mahāthera is a Malaysian Buddhist monk ordained at Mahasi Meditation Centre, Rangoon, Burma, in 1979. He trained under various teachers, notably Sayadaws U Paṇḍita (Paṇḍitārāma), U Tissara (Yankin), U Āciṇṇa (Pa Auk) and U Tejaniya (Shwe Oo Min). Besides practising meditation, he studied advanced Pāli and translation in Thai and Burmese under Sayadaw U Dhammananda at Wat Tamaoh, Lampang, Thailand, 1983-84. He continued to study the Pāli Tipiṭaka in Myanmar and researched on its interpretation and practice until his return to Malaysia at the end of 1994. In 2000 he founded Sāsanārakkha Buddhist Sanctuary, a Theravāda monk training centre nestled among secluded valleys and brooks near Taiping, Perak, Malaysia. Venerable Aggacitta is a Monastic Adviser of the Theravāda Buddhist Council of Malaysia (TBCM). 5) The Sunday’s Puja Service in Mandarin will be off for 4 Sundays and will resume on 19 June 2016. 6) This Sunday’s Dhamma Talk (29/5/16,10.10am) in English will be on “Buddhist Monastic Robes & Attire” by Bro Wong Mun Yee. Bro. Mun Yee began learning Buddhism at St John’s Institution’s Buddhist Society, Kuala Lumpur. He participated actively in Buddhist youth camps and was a core member of Dhammaduta Youth (D2Y). In university, he established Mitchell Buddhist Group and graduated from Australia. He had the opportunity to serve both local and international Buddhist organizations in various capacities such as representative of Sasanarakkha Buddhist Sanctuary, Deputy President of Buddhist Gem Fellowship and Assistant Secretary General (Buddhist Education) of the World Fellowship of Buddhist Youth (WFBY). He continues to share Dharma with young adults from local camps, colleges and universities such as Sunway, UCSI, MMU, IMU & Monash. Beside his active participation in Dhammaduta work, he continues to pursue his passion as founder and creative director of Flora Mandarava, a floral design company. 1) This year’s Wesak day falls on Saturday, 21 May 2016. Our Wesak Celebration will start on Wesak Eve, Friday, 20 May with lighting of Blessings Oil Lamps at 7.30pm followed by Wesak Eve Buddha Puja, Dhamma Talk by Ven. Nyanaramsi, Procession Round the Vihara and Bodhi Tree, Chanting and Meditation. On Wesak Day, Puja Service will commence at 8.00am followed by the official launching of the Wesak Day Celebration at 9.45am. Blessings Service will be carried by the Maha Sangha. On this Wesak Day, besides others, everyone has the opportunity to perform dana great merits by contributing to build our temple extension. To-date SJBA have received donations of about RM 5.6 million for its Building Extension. The cost of construction of the extension block is RM5 million (not including GST and interior design works which is estimated to be additional of about RM1 million, hence total of about RM6.5 million). We look forward for help to raise the balance in order for us to successfully complete the construction of the new building by end 2016. From 11.00am to 2.30pm, vegetarian food will be provided. There will be a Blood Donation & Organ Pledge Campaign. We need around 200 volunteer helpers to help organize all these activities. Please register yourselves by writing your name at our Notice Board or call Sis. Lily at Tel. 03-56315299. 3) On 17 July 2016, SJBA is hosting a 1-day Sutta Study with Meditation Workshop on “HOW TO DIMINISH THE EFFECTS OF BAD PAST KAMMA”, facilitated by Ven. Aggacitta. 4) This Sunday’ Dhamma Talk (10am) is on “Cultivating Mindfulness Based Emotional Composure” by Bro. Billy Tan. Billy Tan is a Professional Trainer and Business Development Consultant who has trained countless corporate executives and business professionals in more than 20 countries over the past three decades. Bro. Billy is a Certified Master Practitioner of Neuro-Linguistic Programming (NLP), as well as being certified by the International Association of Counselors and Therapists, USA, in Clinical Hypnotherapy. In recent years Bro. Billy has conducted several professional training programs for resident and visiting Monks at the Buddhist Maha Vihara, Brickfields, in the areas of Emotional Intelligence, Communication, Professional Presentation, Public Relations, Community Services, Leadership, and Management. In sharing the Dhamma, Bro. Billy researches discoveries from the fields of Neuroscience and Psychology to present teachings of the Buddha from a scientific perspective. 1) SJBA had a very successful Charity Dinner on 7 May which helped raise about RM2 million (including the amount raise from donors sponsoring the 13 Dhamma Rooms and 2 Senior Citizens Room). Adding this amount to the grand total, to-date SJBA have received donations of about RM 5.6 million for its Building Extension. The cost of construction of the extension block is RM5 million (not including GST and interior design works which is estimated to be additional of about RM1 million, hence total of about RM6.5 million). We look forward for help to raise the balance in order for us to successfully complete the construction of the new building by end 2016. 2) This year’s Wesak day falls on 21 May 2016. Our Wesak Celebration will start on Wesak Eve, 20 May with lighting of Blessings Oil Lamps at 7.30pm followed by Wesak Eve Buddha Puja, Dhamma Talk by Ven. Nyanaramsi, Procession Round the Vihara and Bodhi Tree, Chanting and Meditation. On Wesak Day, Puja Service will commence at 8.00am followed by the official launching of the Wesak Day Celebration at 9.45am. Blessings Service will be carried by the Maha Sangha. On this Wesak Day, besides others, everyone has the opportunity to perform dana great merits by contributing to build our temple extension. 3) Members are cordially invited to attend a 6-lesson “Introduction to Satipatthana Meditation Course”, to be held at Subang Jaya Buddhist Association, end of May till Early June. 4) This Sunday’ Dhamma Talk (10am) will be given by Venerable Mahacara. 5) This Sunday’s Dhamma Talk in Mandarin (at 11.30am) is on “The Highest Blessing” by Bro Tom Hen. Bro Tom is an accredited Chinese physician and acupuncturist focuses on family medicine in Puchong. He is a long serving Dhamma volunteer and a Dhamma speaker with strong interest in Engaging and Applied Buddhism. At present, he is an Exco member of Kinrara Metta Buddhist society. 这个星期日的讲题是” 最好的祝福”, 讲师是幸文龍居士. 幸文龍居士持有中医学位,主修针灸与内科。目前在Puchong 家庭中医诊所服务. 幸居士在佛教界活跃已久,喜欢演说有关佛教联系与实用的主题，目前他是Kinrara Metta Buddhist Society 的理事. 1) To-date SJBA have received donations of about RM 3.5 million for its Building Extension. The cost of construction of the extension block is RM5 million (not including GST and interior design works which is estimated to be additional of about RM1 million, hence total of about RM6.5 million). We look forward for help to raise the balance in order for us to successfully complete the construction of the new building by end 2016. Yogis are required to take 9 precepts during the retreat. Yogis who are not able to take 9 precepts, kindly inform the organisers in advance and make your own arrangement for light dinner. We are seeking a contribution of Rm292 per yogi to defray the running cost for meals, lodgings, transportation and fee for the usage of the meditation hall. Registration is open from the 1st of February on the first come first serve basis. Confirmation of place is upon submission of Registration Form with Payment to Sis. Lily. Registration closed on the 15th of April. 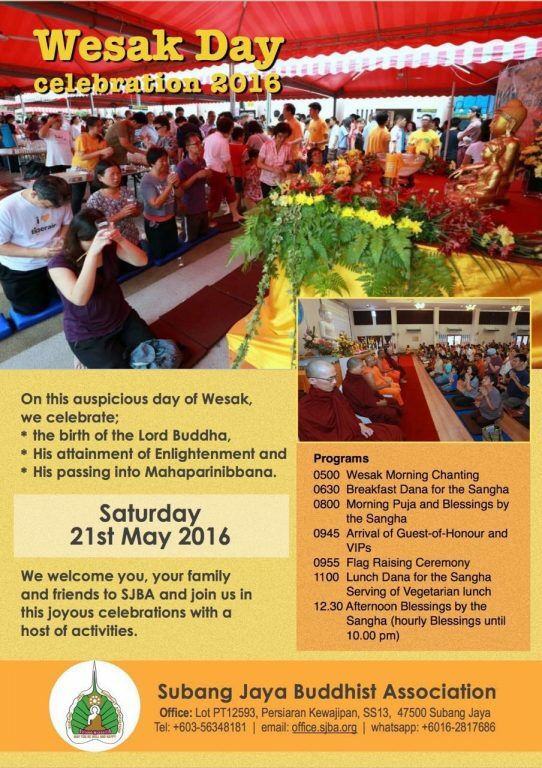 3) This year’s Wesak day falls on 21 May 2016. Our Wesak Celebration will start on Wesak Eve, 20 May with lighting of Blessings Oil Lamps at 7.30pm followed by Wesak Eve Buddha Puja, Dhamma Talk by Ven. Nyanaramsi, Procession Round the Vihara and Bodhi Tree, Chanting and Meditation. On Wesak Day, Puja Service will commence at 8.00am followed by the official launching of the Wesak Day Celebration at 9.45am. Blessings Service will be carried by the Maha Sangha. 4) Members are cordially invited to attend a 6-lesson “Introduction to Satipatthana Meditation Course”, to be held at Subang Jaya Buddhist Association, end of May till Early June. 5) This Sunday’ Dhamma Talk (10am) is on “Faith and Devotion in Buddhism” by Bro Tan Siang Chye. Bro. Siang Chye graduated from Kent Institute, UK and with a Master degree from Massey University, New Zealand. He was a former Chairman of the Buddhist Missionary Youth Section and also the parent body, BMSM for one session. He is a striving meditator and has practised under several prominent meditation teachers locally and in New Zealand. Bro. Siang Chye is currently the Chairman of the Dhamma Committee of SJBA. 6)This Sunday’s Dhamma Talk in Mandarin (at 11.30am) is on “Five Spiritual Faculties” by Sis Tan Yee Yong. Sis Tan Yee Yong graduated with Bachelor of Science in Computer Sience and MBA. She obtained MA in Buddhist Studies from IBC, Thailand. She is now a Dhamma committee member of SJBA. 这个星期日的讲题是”五根”, 讲师是陈玉容居士. 玉容居士持有科学学士学位及商业硕士学位，在商业界工作。她曾经是我们首邦再也佛教会青年组主席，及佛法小组组长 ，在学佛路上， 她持有佛教文凭及国际佛教大学佛教研究文科硕士 。目前她是我们首邦再也佛教会 佛法委会小组成员.